You've spent hours searching for the ultimate pair of jeans and they are finally in your hands. Finding blue jeans with the perfect fit is exciting, except when they're too dark. Not only do faded blue jeans portray a relaxed and beachy style, they are also softer and more flexible after some of the color has been removed. 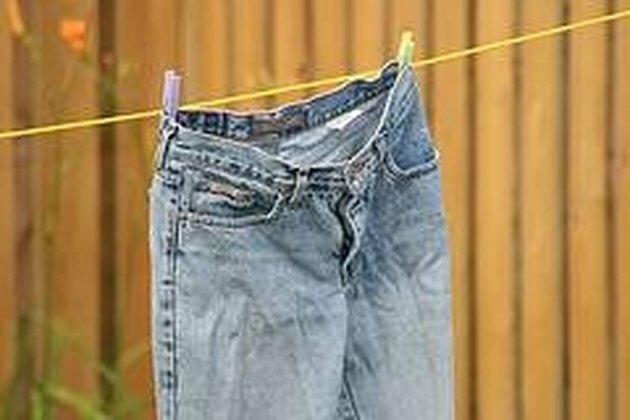 Wash the new pair of jeans twice before starting the fading process. This will remove any commercial starches in the fabric. Start the washing machine and let it fill up with hot water. When the tub is full, shut the washer off. Now, take the bleach and pour about 1 quart of beach into the washing machine tub. Drop the jeans into the water making sure the entire garment is soaked. With the stick or dowel, press the jeans deep into the water, gently swishing it around inside tub. The idea is to get the pants evenly saturated with the bleach. Let the jeans sit in the tub for 20 to 30 minutes. Lift the jeans out of the water periodically to check on the color. if they haven't reached the desired color, add a little more bleach and swish the jeans around again. After the jeans are the desired color, rinse them in cold water and let them sit in a sink full of water and white vinegar. This will set the color. Then run the jeans through a normal wash cycle by themselves.